The most versatile portable panel display system. Panel and pole systems can’t be beaten for versatility. Being modular they offer fantastic flexibility so you can increase or decrease the size of display to suit the occasion. Our stock displays are made from base line panels but we also have a number of other panels types available. Call one of our display experts and they will be happy to advise you on the best display board solution 0844 800 1020. For information on how to assemble check out our pole and panel setup guide. Pole and panel stand displays are the most versatile portable freestanding panel display system you can find. 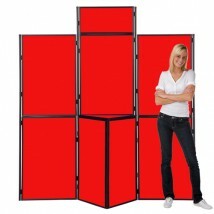 Use panels landscape or portrait, Add panels or remove panels to create the display you need. Choose from a simple mono or duo display board for school or studio display. At the other end of the scale a 19 panel kit, ideal to create a complete trade show or exhibition stand backdrop. The modular design makes pole and panel systems a great choice for regular business use. 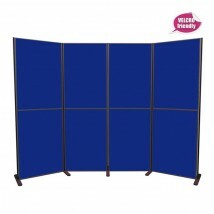 They are flexible so you can increase or decrease the size of your display to suit the event. Panels are covered in Velcro friendly Nyloop fabric on either one or both sides, Attach your promotional materials and graphics in seconds, by using Velcro directly to the board. Velcro makes changing your marketing messages fast and easy. If space is at a premium, the panels can also be used in a square to create a 360 degree display. Maximum display with a minimal footprint – ideal for making the most of small stand or classroom spaces. Along with vertical panel displays, the pole and panel systems can include tables and plinths. This makes a handy surface for a laptop, I Pad or to display promotional literature. Panels are available in 12 colours, so you are sure to find one to match or complement your business branding. You also have a choice of frame colour to fit in with your other event furniture and accessories. Double sided boards can be finished with different colours on each side, so the combinations are almost endless. The pole and panel displays are fast and easy to put up with no tools required. They are just as easy to collapse down easily for compact storage and easy transport between events. What are pole and panel displays used for? Ideal for Open days, art shows, public information boards, meetings and careers fairs. NEED SOMETHING BIGGER? View our range of large customised pole and panel modular stands. These can include, table tops, cupboards, slat walls or call to discuss our FREE pole and panel design service. Rated 9.8 / 10.0 based on over 862 reviews on Trustpilot .so you are sure to find one to match or complement your business branding, there is also a choice of frame colour to ensure your display boards blend seamlessly with your other event furniture and accessories. Double sided boards can be finished with different colours on each side, so the combinations are almost endless. Ideal for open days, art shows, public information boards, meetings and careers fairs, the pole and panel displays are fast and easy to put together with no tools required, and collapse down easily for compact storage and easy transportation between events. People who bought these portable folding exhibition display systems were also interested in exhibition accessories, clip on display lights, literature brochure stands, large format printing, folding exhibition display stands, popup display packages, banner stands. NEED SOMETHING BIGGER? View our range of large customised pole and panel modular stands which can include, table tops, cupboards, slat walls or call to discuss our FREE pole and panel design service.